Madonna del Buon Consiglio-detta Madonna delle " Mele "
Sunday January 1st is the special feast day honoring Mary as Mother of God. My prayer for January 1st and for the year of 2012 is that God might incline my heart to do His will. 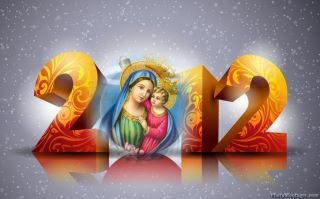 When we follow the example of Mary who gave her total and complete "yes" we will have a great year, come what may. January 1st is also the World Day of Peace. So let's all get to mass and pray a family rosary together for peace on earth and peace in our towns and families. One way to live our faith more deeply this year is to be prepared when we come to mass. To read the readings before hand, to arrive early and be ready when mass begins, instead of walking in 10 minutes late and being unsettled. One thing I have really enjoying doing this year is listening to Fr. Robert Barron's homily before I go to mass. 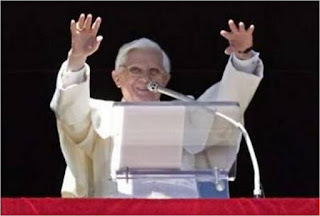 Every Thursday, www.WordOnFire.orgposts his homily for the coming weekend. You can download the ap to your smart phone or listen on your computer. 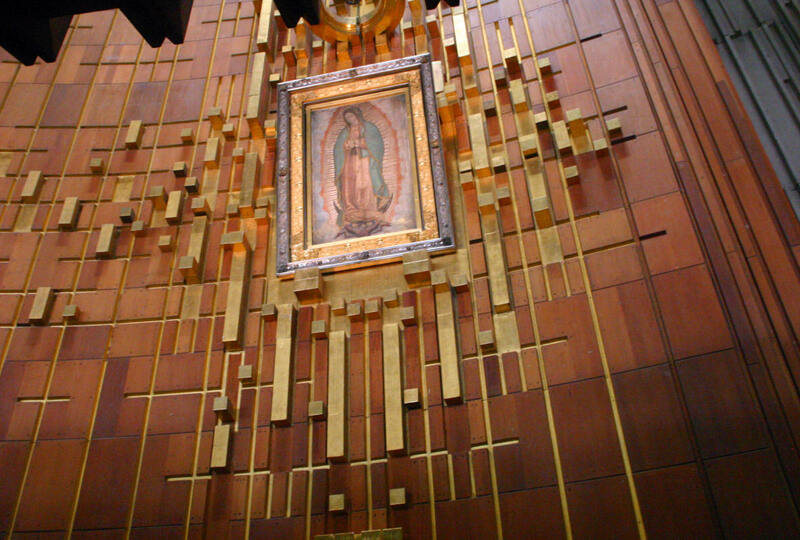 Click here to listen to his homily for the Solemnity of Mary, Mother of God. Today began at 10:45 am with the Notre Dame fight song blaring into the teenagers' rooms. Bob got out the old "Wake up the Echos" VHS tape that he and his roommates watched a million times back in the 80s while students at ND. The kids couldn't understand why we had to wait for it to "rewind." Bobby, home for the holidays from FSU was happy to get up and get ready to leave for the game. His girlfriend, Jen, got a bunch of tickets to the bowl game and so Bobby and Jen, in FSU garb were in high spirits to drive to Orlando for the game. John chose a Notre Dame jersey to side with Bob and thus~ the house divided. Excellent game watching food, homemade soft preztels to compliment the chicken wings! If you have ever sung the advent song "O Come O Come Emmanuel" then you are familiar with the "O Antiphons." 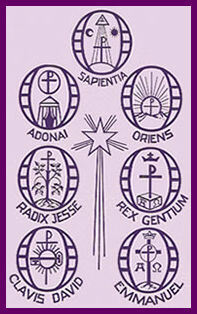 The seven "O Antiphons" are prayers that come from the Breviary's Vespers during the Octave before Christmas Eve, a time which is called the "Golden Nights." Each Antiphon begins with "O" and addresses Jesus with a unique title which comes from the prophecies of Isaiah and Micah, and whose initials, when read backwards, form an acrostic for the Latin "Ero Cras" which means "Tomorrow I come." The O Antiphons are the source of the lyrics of the Advent song "Veni, veni Emmanuel" ("Come, O come Emmanuel") which you can hear by clicking here. It would be beautiful for the family to sing this lovely Advent song at the conclusion of the O Antipons. For the lyrics, see the Lyrics and Melodies to Traditional Catholic Hymns page. 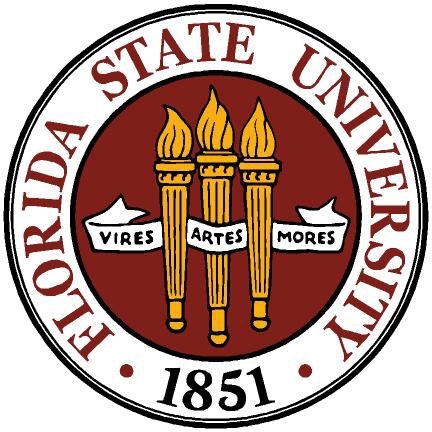 Last night our second son, John, found out he was accepted to Florida State University. Not as of old, when we anxiously awaited a letter in the mail, John was on his cell phone, on the internet waiting for the server to free up so he could access his account. His friends were texting back and forth as they were able to find out if they were accepted. The digital age and college applications has been interesting to experience. Much has changed since Bob and I applied to college in 1982 and 83. But more than the application process changing, our home is going to change. As we went to bed, Bob said, can you believe we will have two in college soon? I wept. I know having the children grow up and become successful and productive citizens is the goal, but as a mother it hurts. These truly are my "babies." And letting go is hard. It is especially hard when you really like your kids, not just love them. In my minds' eye, John and his older brother Bobby are about 5 and 3 years old. Smiling, happy, pushing Tonka trucks around the circle of our house and building Brio trains. "It went so fast" I said to Bob last night, and he said, "No it didn't." "It's been twenty years, Julie." 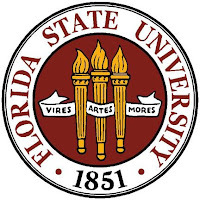 We don't know if John will go to FSU. He was also accepted to USF and has applied to UF too. But we know he will go somewhere. And it will be mostly likely out of town. And so we pray, that John, Bobby and all the younger children will continue to grow in wisdom and grace and that I will get better at letting go. "....but true joy is connected with our relationship to God. Those who have met Jesus in their lives experience a serenity and a joy in their hearts that no one and no situation can take away. St. Augustine understood it quite well; in his search for truth, for peace, for joy, after having sought it in vain in many things, he concludes with the celebrated expression according to which man's heart is restless, does not find serenity and peace, until it finds rest in God (cf. Confessions, I, 1, 1). True joy is not a mere passing state of soul, nor something that is achieved by our own power but is a gift; it is born from the encounter with the living person of Jesus, from making space for him in us, from welcoming the Holy Spirit who guides our life. 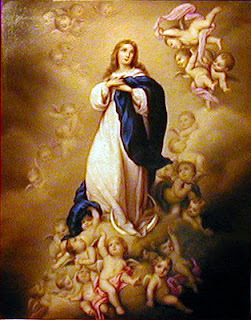 Let us entrust our journey to the Immaculate Virgin, whose spirit exulted in God the Savior. May she be the one to guide our hearts in the joyous expectation of the coming of Jesus, an expectation that is rich in prayer and good works." 1. Jesus came for all people and so His Mother has appeared all over the world. 2. In the darkest days when many were leaving the church during the Protestant revolt in Europe, many more were coming into the Church in Mexico.The word "Catholic" means Universal and so we are. 3. 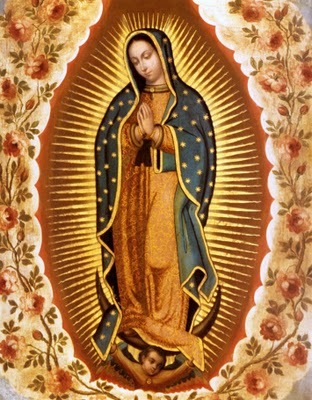 The Virgin appearing pregnant. It is beautiful to have this feast in December, when our hearts turn to Our Lady, heavy in pregnancy. Awaiting the birth of her son. As a mother of 6, I love to think of Mary living our her vocation as wife and mother, through all things but sin. She gives me moral support knowing that she was not exempt from hardship or the "reality" of pregnancy and family life. To honor this feast, serve Tacos and Burritos for dinner tonight. Pray the family rosary. 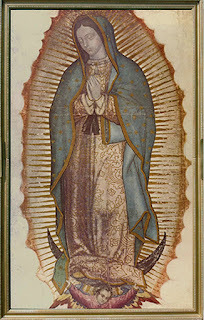 Get or create your own picture of Our Lady of Guadalupe. 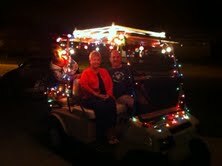 What better way to celebrate the season than to hook up a generator to your golf cart and string it with lights! We had Bob's mom over for dinner tonight and afterward we drove around the neighborhood looking at all the lights. How beautiful that the lights shine so brightly in the darkness. The full moon made it all the lovelier. Be sure to get to mass today. Remember to put your shoes out tonight for the Feast of St. Nicholas December 6th! Today I had the great "chance" of meeting up with a woman who is a real hero of mine, Kimberly Hahn. Through my Lighthouse Catholic Media apostolate, I was set to have a table at the Scott and Kimberly Hahn conference in Tampa FL. I had set up the table the day before and had some of my Lighthouse friends assist me working it. When I arrived, who is the first person I see but Kimberly. She and I got to chat for quite a while about children growing up and leaving home. Quite a topic that has been on my heart lately. Her bible study tape set "The Proverbs 31 Godly Wife and Mother" had been the first way I learned about being a Catholic Wife and Mom back in the late 1990s. At the time we only had 2 children. But Kimberly helped me learn so much about what our Holy Catholic Church really teaches about tithing, openness to life, submitting to our husbands and running a "domestic church." How great to talk with her 15 years later as another chapter of raising children begins. She could not have been more pleasant, interesting, interested and kind. And when she gave her talk at the conference, she "knocked it out of the ball park!" God Bless you Kimberly Hahn!